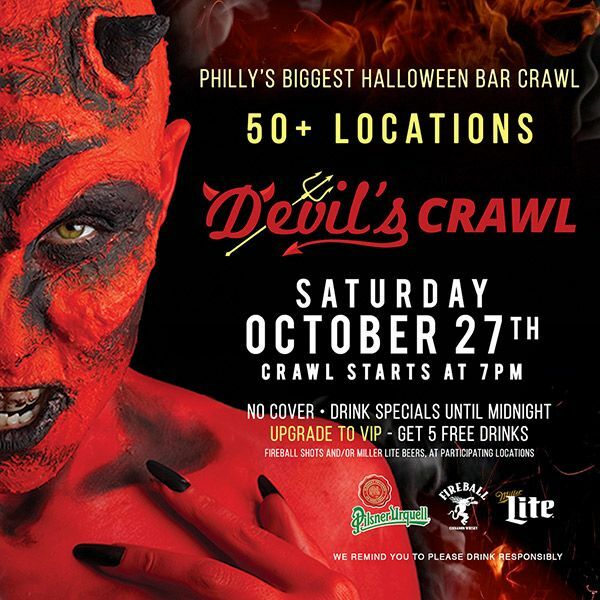 The Devil's Crawl will give you access into multiple locations, no cover charge all night at all locations plus great drink specials from Miller Lite, Fireball, Pilsner Urquell, and more (until 11pm) We have something for everyone. Just look at all the participating bars and restaurants (click link above to visit website) - they are THE places to be in the city! So, gather your friends and get your costume now. This event is strictly 21+ with proper ID required. Everyone will receive a custom coupon book (they do not need to be used the night of the event) - here's what's included. Some items are WHILE SUPPLIES LAST so be one of the first to register to claim your items! NEW FOR 2018 - VIP DEVIL - LIMITED SUPPLY OF TICKETS - Grab 5 FREE drinks with your ticket at participating locations - Your choice of Miller Lites and/or Fireball drinks at participating locations. See Official Website link above for more details on where you can redeem and for what. [CHECK IN] = you can check in & start at this location starting at 7pm and you must be checked in by 11pm. [VIP] = a location where you can redeem VIP drink tickets. [COVER WAIVED] = a location where cover charge has been wavied for ticket holders! JUST ADDED - everyone will have access to the official AFTER PARTY at Gardendale Social Club and when you show your wristband, you will get your first drink FREE and no cover!! Center City Area - 27 locations and growing! Old City - 5 locations and growing! University City - 4 locations and growing!